An intense column of green light came in through the opening, and then another, and then a third. They were as high as a tall man, and at the summit of each of them a globe of pale, phantasmal white light floated, from which crackling sparks sprang continually: three heads of opaque fire above the slender transparency of three green columns! In 1908, Jean de La Hire, the creator of The Nyctalope, penned The Fiery Wheel, a classic space opera in which five Earthmen are abducted in the eponymous spacecraft by aliens from Saturn, and taken to Venus and Mercury where they encounter strange lifeforms, before returning to Earth through mind transfer. 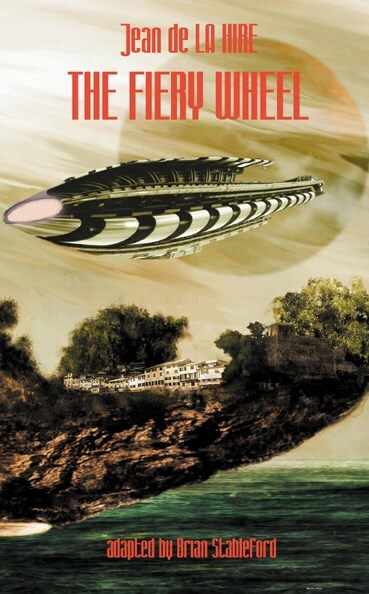 The Fiery Wheel is the first work of fiction to feature the theme of "alien abduction," all the more remarkable because such abductions are achieved by means of a vehicle resembling the "flying disks" or "flying saucers" later credited with this phenomena. "It is an essential piece in the evolutionary jigsaw of 20th century speculative fiction, without which the picture would be incomplete." -- Brian Stableford.